SHARON, Mass. 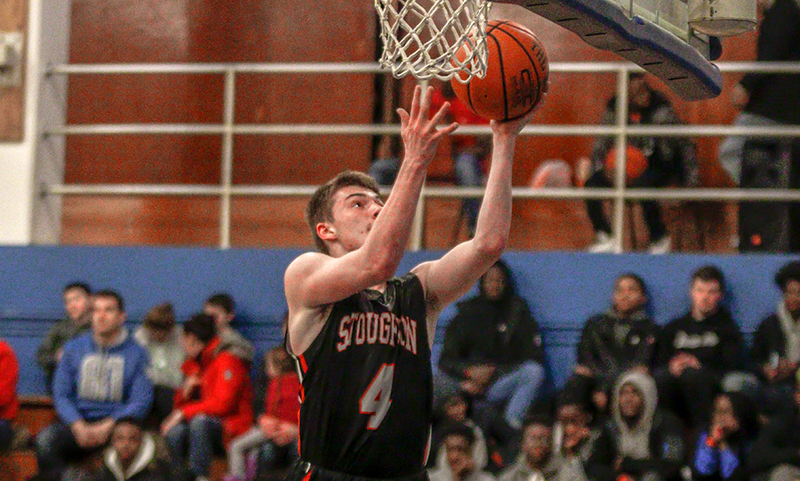 – Stoughton head coach Greg Burke didn’t care about the rain, wind or muddy field – he wanted his team to play on Saturday afternoon. Burke had a good reason as his Black Knights were ready to go from the opening drive and neither the rain, wind or the Sharon Eagles could slow them down as Stoughton rolled to a 37-0 win. After North Attleboro stifled Stoughton’s run game a week ago, the Black Knights made sure to get their ground game going early. 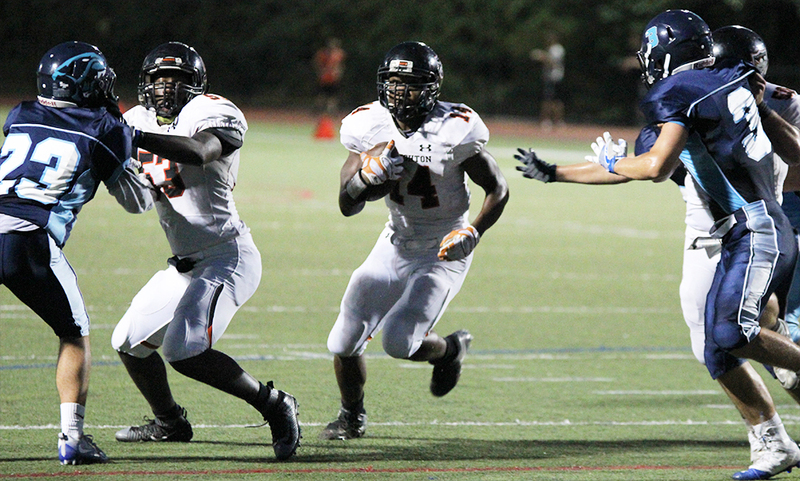 The Black Knights finished with 321 rushing yards and three rushing touchdowns in the win. Stoughton needed just three plays on the first drive of the game to find the end zone. Izon Swain-Price opened the game with a 39 yard rush and Justin Ly scampered up the middle for a 22 yard touchdown and a 7-0 lead just 1:38 into the game. 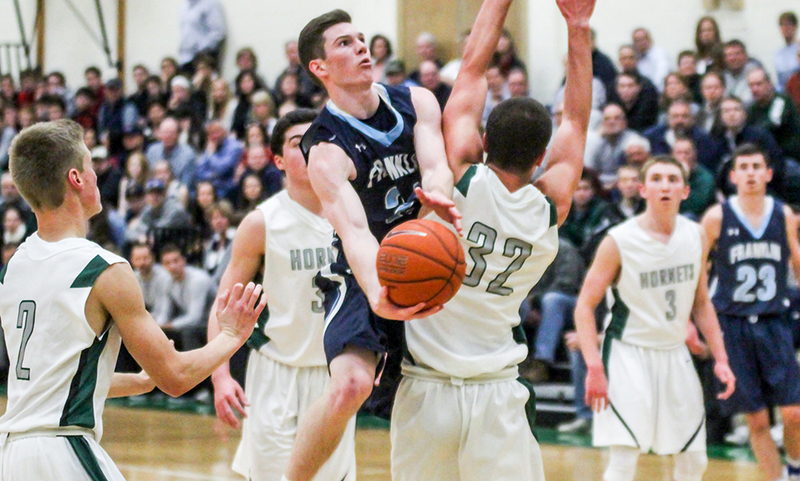 The Black Knights forced a quick three and out from Sharon and cashed in quickly again on their second drive. Again, just three plays into the drive Stoughton was in the end zone as Swain-Price got around the edge for a 39 yard score. Sharon had its best offensive series of the game next, moving into Stoughton territory to the Black Knights’ 21 yard line. But a block in the back call forced the Eagles back 10 yards and on 4th and 10, the Eagles were unable to complete the pass to keep the drive going. Stoughton’s run game was back at it again with Swain-Price gaining 21 yards on second down, followed by a 55 yard touchdown run from Ryan Sullivan to make it 21-0. The Black Knights’ defense stepped up again on Sharon’s ensuing drive. The Eagles attempted to pass on second down but Nick Hardy stepped in for the interception and returned it 33 yards for the pick six, making it 28-0. Things went from bad to worse for the Eagles as a sack forced them into a fourth and long situation. With the slick conditions, the snap on the punt was fumbled and Stoughton took over at the Sharon 33 yard line. After a penalty pushed the Black Knights back, Stoughton sophomore quarterback Evan Gibb hit Swain-Price in stride for a 41 yard score, making it 35-0 before the halftime break. 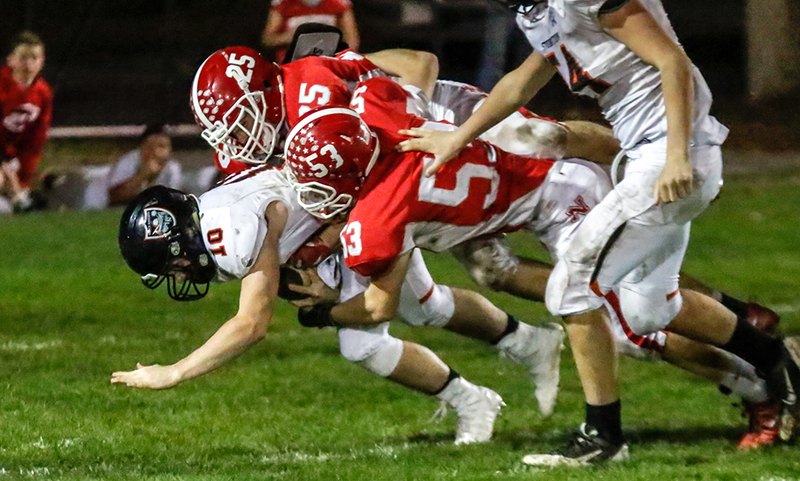 The only scoring play of the second half came with just over four minutes left in the game when Alex Iverson tackled a Sharon running back in the end zone for a safety to make it 37-0. Swain-Price finished with 118 yards on the ground, 41 receiving yards and two touchdowns, Sullivan added 77 yards and a touchdown, Ly finished with 36 yards on four carries and David Bell added 32 yards. Juvan Elisma led Sharon with 52 yards on 11 carries. Stoughton football (2-2, 1-1) will look to make it two in a row when they take a trip to Canton on Friday night to take on the Bulldogs. Sharon (3-1, 1-1) will try to bounce back when they host North Attleboro on Saturday afternoon. FRANKLIN, Mass. 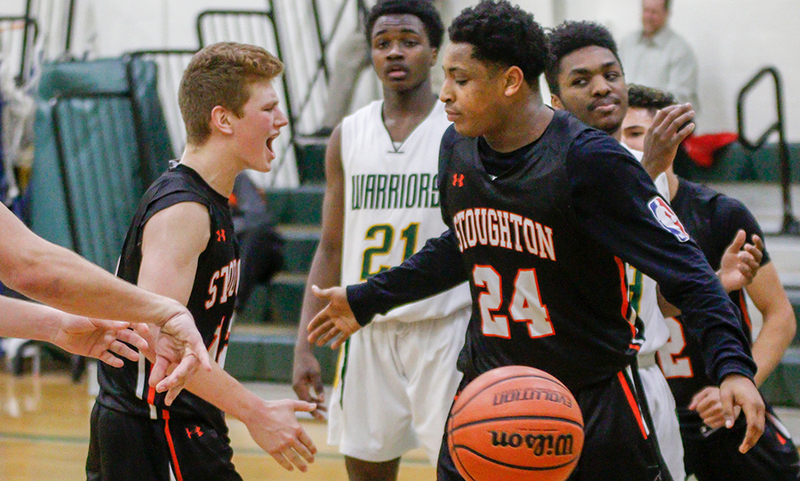 – As Stoughton fought its way through the ups and downs of the 2015 season to finish with a 6-5 record, there were plenty of positives and negatives. One big positive was the experience the players got, mainly the young offensive line. That experience paid off big time on Friday night as the Black Knights dominated up front behind it’s five-senior offensive line en route to a 58-19 statement win over Franklin. Lino Azul, Ryan Pierre, Andrew Iverson, Harry Kimball and Brendan Walsh paved the way as Stoughton racked up 454 yards rushing and over 500 yards total in the win. Stoughton opened the game on a seven play, 72 yard drive, capped with a two-yard rushing score from senior Ryan Sullivan (10 carries, 153 yards, four touchdowns, interception). Dave Cellucci’s (4/4, 60 yards) 20 yard pass to Izon Swain-Price and Sullivan’s 23 yard carry just prior to the score were highlights on the drive. It didn’t take long for the Black Knights to double their lead as senior Jack Connelly ripped the ball free three plays into Franklin’s drive and Marselis Cox scooped the loose ball up and sprinted in from 45 yards out. Cellucci’s keeper for the two point conversion put Stoughton up 14-0 just over four minutes into the game. The Black Knights forced a punt but were faced with 3rd and 20 on the ensuing drive. Cellucci floated one up and Connelly went up and grabbed it for a 27 yard completion and a first down. Two plays later, Swain-Price got around the edge for an eight yard touchdown, putting Stoughton up 21-0. Sullivan came away with an interception on Franklin’s next possession and the Black Knights converted quickly. After a 28 yard gain from Sullivan on the ground, junior Justin Ly (11 carries, 137 yards, one touchdown) pounded it up the middle for a 10 yard touchdown, giving Stoughton a 27-0 lead at the end of the first quarter. After Franklin was unable to convert on fourth down, Ly took the first carry of the next drive 39 yards. Six players later, Sullivan took the toss to the outside for a five yard touchdown run to make it 34-0. The Panthers were able to get some life back right before halftime, using a couple of screen plays to cut into the lead. Facing 3rd and nine, Franklin QB Jake Noviello (14/33, 215 yards, 2 touchdowns) hit running back Jacob Wolowacki (128 all purpose yards) for a 48 yard completion on the screen. Two plays later, Wolowacki punched it in for the Panthers’ first touchdown. Franklin got possession back quickly, forcing a fumble that was recovered by Brad Jarosz. On the first play, the Panthers went back to the screen, with Noviello hitting Wolowacki for a 40 yard touchdown to bring the score to 34-12. Stoughton struck once more in the final minute of the first half, using three straight runs – Sullivan for 24 yards, Ly for 32 yards and then Sullivan for a 10 yard score – to go into the half with a 40-12 lead. On Stoughton’s first play of their second drive in the second half, Sullivan bust through a hole up the middle and scampered in for a 52 yard touchdown to make it 46-12. Franklin struck back with Noviello dropping a perfect pass into the hands of Kinley Baird on the sideline and the senior did the rest, sprinting in for a 68 yard touchdown for the Panthers. Stoughton added a pair of scores in the final quarter with Swain-Price dashing up the middle for a 40 yard touchdown and David Bell getting around the corner for a 34 yard score for the Black Knights. Stoughton football (1-0) will welcome Marshfield to town next Friday in a rematch of week two from a season ago. Franklin (0-1) will look to get its first win of the season with a trip to another Davenport division team, Milford (0-1).